She was given a medicated bath and a Convenia shot. Treating as dermatitis from flea allergy but she is flea-free now. Will be spayed once her skin heals and fur regrows. Paws crossed! Updates in the coming weeks. Very sweet temperament. She weighs just under 15 lbs. 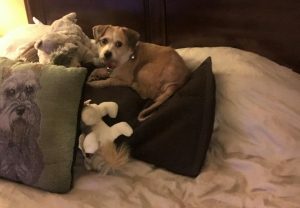 and is listed as a Shih-Tzu/Terrier mix. Heartworm and Lyme negative.